Bose has been working on technology that cancels noise — and in effect, recreates silence — for 35 years. The technology was integrated into its over-ear QuietComfort 25 headphones. Now it has been miniaturised and implanted into more convenient in-ear headphones, the QuietComfort 20. Distinct traits set the QuietComfort (QC20) apart from the usual in-ear recipe, like the battery pack situated near the 3.5mm auxiliary plug. It is long and slender, but it isn’t heavy enough to cause damage to the headphone socket of your smartphone or tablet. The excess bulk is something to be mindful of at first, with its addition taking up space in pockets or getting in the way of coat buttons. Soon enough it disappears into the cabling and becomes no different to any another pair of headphones. 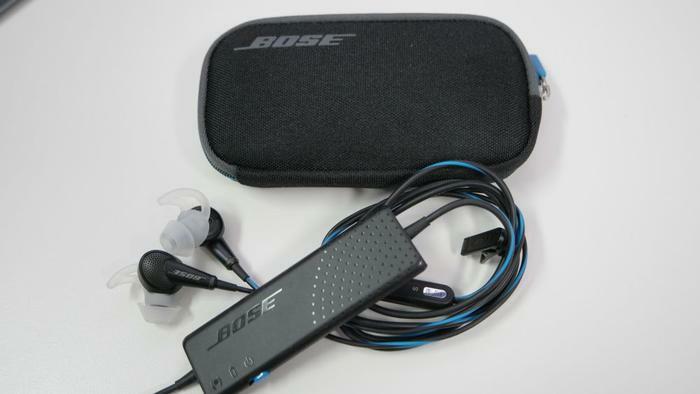 Bose claims 16 hours of noise-cancelling music can be enjoyed — that’s longer than most plane rides. Our testing revealed 12 hours of music can be played before the battery gives way, though that was over three separate listening sessions. Run out of battery and it will continue to play music, only without the silence afforded by the noise cancelling tech. The battery brick measures approximately 9cm x 3cm. Two LED lights communicate remaining battery life and whether or not the noise cancelling is in use. Further up in the cabling is an inline remote, which makes it possible to adjust the volume and take calls, without the bother of whisking out your smartphone. Another button actively relays outside noises. This trick makes it possible to cross a road, mindful of oncoming cars, without having to take the headphones off. The earbuds don an uncharacteristically wacky design, but there is method behind the madness. Rubber tips anchor at the back of earlobes and extend a cone-shaped corridor towards the eardrum. Using up all of this space is how the petite QuietComfort 20 can play back sound with a semblance of dimension. There are other advantages to the design of the buds. Rubber helps form a seal between the headphones and your ears so that external noises stay out and the music you’re playing remains private. 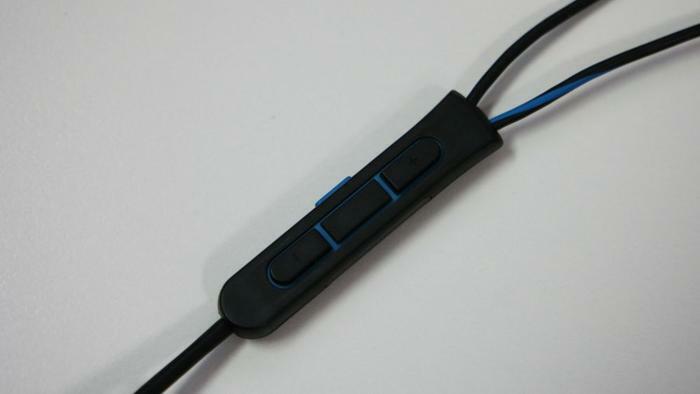 This is a form of passive noise cancellation, where the design of the earphones naturally discount external sounds. 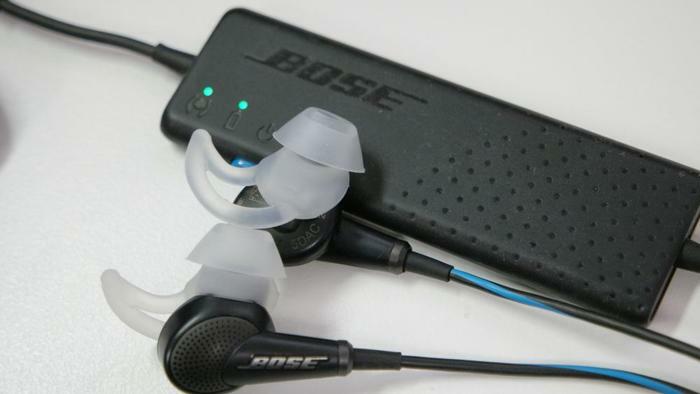 Compounding this effect is Bose’s active noise cancellation technology. Many different parts work together to make it possible, involving an array of microphones nestling in the buds and an electronic chip located behind the inline remote. The technology works by identifying unwanted sound and then creating opposing signals in an effort to cancel them. It all happens in a fraction of a second and that is quicker than you can notice. Not every audio frequency is cancelled as some outside noises can still be heard. The hum of a train and the chit-chat of its commuters are largely reduced, but the high frequency pitch of steel wheels scraping on railings remain. The keys of a chiclet keyboard being pounded by fingers seep through, whereas the rest of the office ambience is silenced, including the phones that ring in the distance, colleague laughter and the whine of the air conditioning. Most of the noises that aren’t attenuated are drowned by the playback of music. These buds commendably play music back honestly. No particular frequency is favoured, which leaves songs sounding just as the artist envisioned. There’s more available space than you would expect from in-ear headphones. Instruments are tactfully layered and this means it is possible to isolate one sound from the other. Listening to The Killers’ Mr Brightside, we could easily pick the drums from the symbols, whereas a lesser set of headphones would’ve mashed the two together. Dimension is also served well as the music envelopes. This is the case with the trance anthem Wasteland, a collaboration between Mike Saint-Jules and Stine Grove, as the deep, rounded bass sprawls from every direction. Complementing it are high, precise trance notes. There’s more volume than most people will need. Eminem’s Lose Yourself was played at 80 per cent to max, with deft bass and gusto, all the while never wavering in clarity. These headphones are rich enough in sound to elicit an emotional response. Up the volume and you will begin to rhythmically tap your foot and nod your head, not like a rebel forgoing social etiquette, but rather like someone who is too happy to care.